Adult Sunday School is held from 10:45-11:45 a.m., following the Sunday Worship Service. Everyone is welcome to join our thought-provoking discussions. Join us for our winter Sunday School session, starting Sunday, January 6th! Jeff Presseau will lead this series. The Webster’s definition of doubt is: to be uncertain about something; be undecided in opinion or belief. Some synonyms for “doubt” include: apprehension, confusion, disbelief, lack of confidence, misgiving, mistrust, quandary, skepticism, suspicion, uncertainty, and reluctance. Do you recognize any of these in your life? 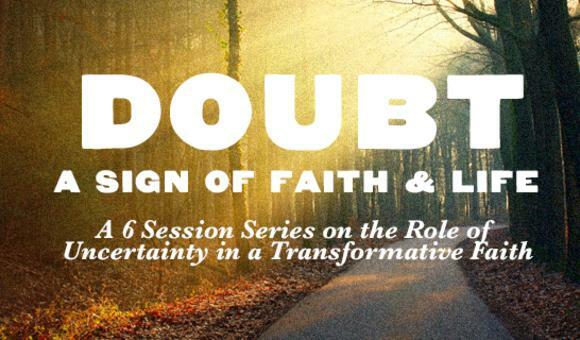 If you do, you are in the right place as we begin this video and discussion Sunday School series; Doubt – a sign of faith and life. We will journey together with six different video presenters who aren’t afraid to doubt and are convinced that questions and uncertainty are a central element of a vibrant and transforming faith. They believe that mystery is one of the most central ingredients of faith and respect that questions don’t lead us down a slippery slope where we lose our faith completely but rather to a deeper and more meaningful relationship with God that is built not on certainty and blind obedience – but on honesty, vulnerability, and trust. Taught by Pastors Robert Johnson and Eric Douglass, the focus was on the Book of Revelation, looking at segments of this important Biblical work from both historical and cultural perspectives. Good presentations and lively class discussions make for an educational Sunday School series – one and all are invited to join us this Sunday! Prior Series include: Presentations and discussions using the book The Answer to Bad Religion is not No Religion by Martin Thielen as the touchstone for the series led, by the Rev. Eric Douglass. Earlier, the Rev. Terry Diebold led us through a truly engaging series focused on practices that deepen one’s life with God, such as meditation and prayer.